Continuing with my series of seasonal mini quilts for our hallway, I made this mini quilt using summery colors from my stash and an improv curve technique. Earlier this year I made a quilt using improv techniques I learned from Sherri Lynn Wood. I can't share that quilt here until her book is published (my quilt was not accepted for the book but uses techniques described therein, so she has asked her many testers not to share until after the publication date). It also involved improv curves. For this mini, I used the same idea but extended it to the whole quilt, instead of using blocks. 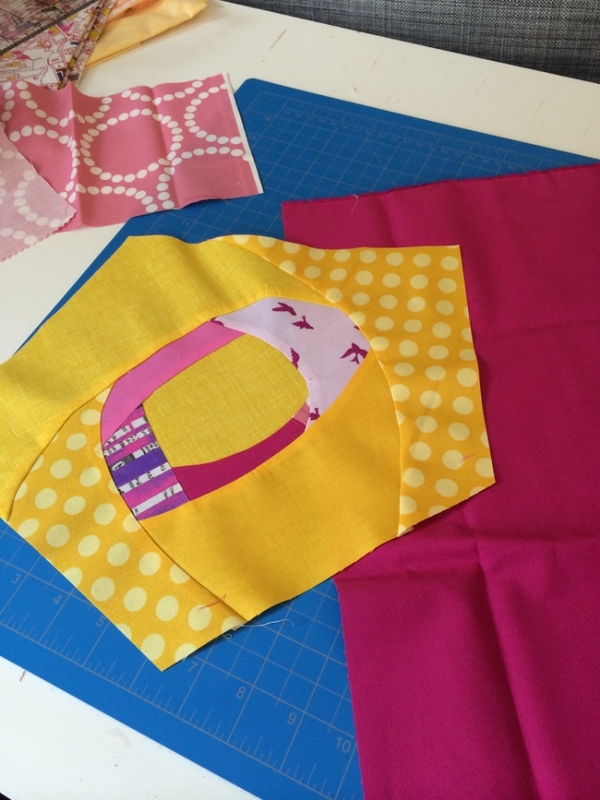 The basic idea is to start with a square or rectangle, layer another over one of the corners, and cut the two pieces of fabric at the same time, creating a curve instead of a sharp corner. Sew those pieces of curved edged fabric together and iron. Then to the same thing on the next corner and continue around in a clockwise or counterclockwise manner (it doesn't matter which way you go). It's like building a log cabin block, but you are cutting free hand curves instead of using straight strips of fabric. I've included several pictures of my process in order to give you an idea of how I proceeded. I wasn't sure this idea would work... then I saw this quilt on pinterest and it was very similar to the idea in my mind. It's always so interesting when you think you have imagined something and then you see someone else has already done it! I was happy to see this quilt because it let me know the quilt in my mind would be possible to make. I also think Kati did a great job on hers. I love her color choices. This was not an easy one. It was really difficult to get the quilt to lay flat as I kept adding on curved sections. In the end I had to add a couple of darts to get it to lay flat (another technique I learned from Sherri Lynn Wood). The darts helped, and after it was washed I blocked the quilt to further help it lay flat. 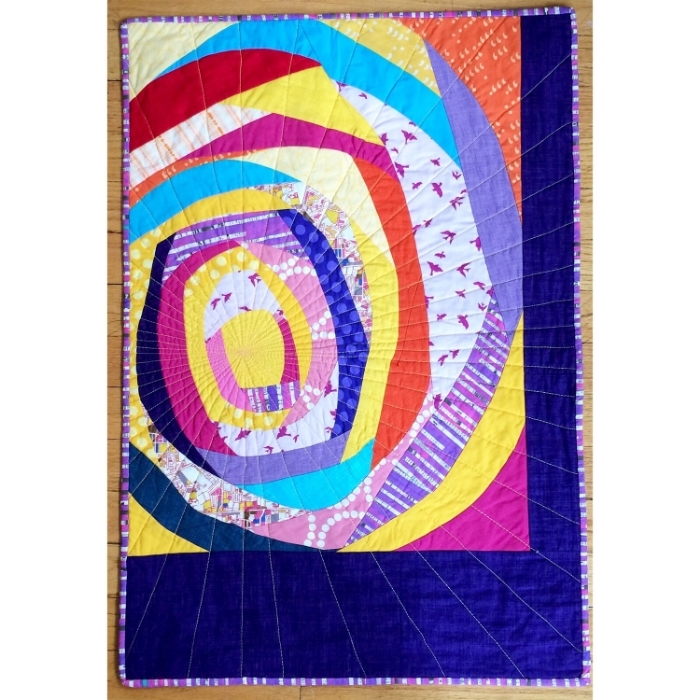 I like the improv curve style of this quilt. However, when I hung it in the hallway, it immediately struck me that it looked like a big piece of tie-dyed cloth. And guess what. I hate tie-dye. And unfortunately, once I saw it, I couldn't unsee it. I think, perhaps, that the colors I chose were responsible for this look of tie-dye. They were too harsh, maybe, too jarring. I should have used some more neutrals and lighter values, perhaps. I ended up not being very happy with this quilt. I was glad when summer was over and I could take it down and put up something else. Maybe I will try my hand at another summer mini before next year. I will have to put some thought into what makes a good summery color palette. Even though it wasn't my favorite, it was a good learning experience, as always. Onward.